A Decoys and Wildlife Art online gallery specializing in hand carved duck decoys and paintings by popular wildlife artists, located in Frenchtown, New Jersey. to Decoys and Wildlife Gallery in Frenchtown, NJ. As our name states, we are a unique gallery that specializes in all forms of wildlife art and duck decoys. What makes us unique is the selection of art we offer in a wide variety of media and our quality custom framing. Take a minute to glance at the sampling of art forms you will find in our gallery. This is just a partial listing of what you can expect to see, and our selection is continuously widening as new talented artists are discovered. The gallery has been in business for 15 years. We are open every day from 10:00 a.m. to 6:00 p.m. (except Christmas) or anytime by appointment. Duck Decoys and Carvings - From working decoys to decoratives which are true works of art, we have a large selection of birds to choose from. While we may specialize in Delaware River style decoys, we also represent carvers from all over the country, including many decoratives that are award winning in world class competition. Our song and shore birds run the gamut from stick birds (slicks) to detailed miniature and full size birds that are so life-like, many people believe they are looking at feathers. Interpretive Art & Figures - The gallery also features unique items of interpretive art that reflect the finest in nature sculpture, and decorative objects created from natural materials such as wood burls and carved alabaster. Custom Framing - We feature a full line of custom framing with a wide variety of mounting (Vacuum, Museum) and mat ( shadowbox, hand wrapped, triple) options. There are many moldings that we stock, including many fine burls. Special Events - We also host shows for some of the top names in wildlife art in order for our customers to meet the artists and view their work. And throughout the year we have special events, such as our annual "Original Miniature" show in the fall and our "Open House" which is held each February. Many local artists and carvers are here for these events to discuss their work or just to chat. We normally serve refreshments for these socials and everyone seems to have a good time. It�s a great way to run into old friends or meet new ones with similar interests. 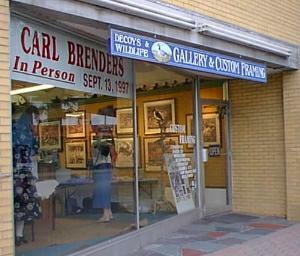 Decoys & Wildlife Gallery is located in downtown Frenchtown, NJ., an historic little town on the banks of the Delaware River which flows through the rustic Delaware Valley between Hunterdon County, New Jersey and Bucks County, Pennsylvania. From Interstate Route 287 in New Jersey, head north or south to the intersection of Interstate Route 78. Head west about 15 miles to exit 15 at Clinton. From Flemington, NJ, take State Route 12 West 12 miles to Frenchtown. From interstate Route I-95, (Philadelphia) head north to the Delaware River. After crossing the river, exit onto NJ route 29 north to Lambertville/New Hope. From New Hope, Pa, follow Route PA-32 North 16-18 miles to the Uhlerstown/Frenchtown Bridge in Tinicum Township, or cross over into Lambertville, NJ and follow NJ State Route 29 17 miles north (much faster). Route 29 brings you right to our door where the road ends in Frenchtown..
To view maps of the area, including a detailed downtown map of Frenchtown, we invite you to visit our local community website at Frenchtown.com. Our Display room is at 55 Bridge Street, 2 doors from the bend at Race & Bridge Streets and directly across from where Trenton Ave. (Route 29) enters Frenchtown's downtown area. When you get to Frenchtown, you can't miss us.